Warner Bros. has some of the most anticipated panels at San Diego Comic Con and for good reason. This is where they will wow audiences with new posters, news and trailers for their upcoming and highly anticipated films. One of the gems, Warner Bros. has gifted the attendees with is the very first trailer for Zack Snyder’s ‘Justice League‘. 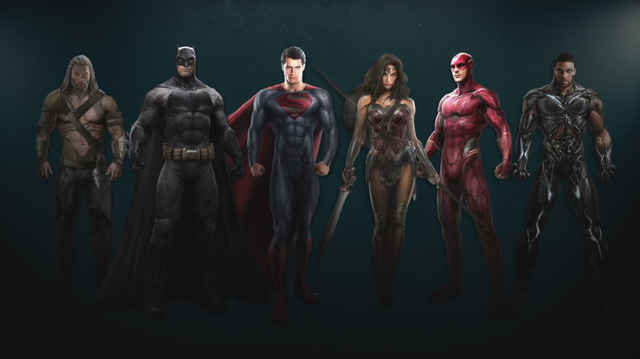 This is a who’s who in the DC Comics superhero world with Batman (Ben Affleck), Wonder Woman (Gal Gadot), the Flash (Ezra Miller), Superman (Henry Cavill), Cyborg (Ray Fisher), and Aquaman (Jason Momoa). The project hits theaters November 17, 2017 – Enjoy! This entry was posted on Saturday, July 23rd, 2016 at 4:25 pm	and is filed under Comics, Film, News. You can follow any responses to this entry through the RSS 2.0 feed. You can skip to the end and leave a response. Pinging is currently not allowed. « Enjoy The Trailer For ‘Wonder Woman’!!! Tristan, I have nowhere to send this letter and no reason to believe you wish to receive it. I write it only for myself. And so I will hide it away along with all the things left unsaid and undone between us.